This weekend as many as 2,500 residents of Mosul escaped from the western half of a city that has been under the yoke of so-called Islamic State (IS) for almost three years. Aid agencies estimate that there are approximately 750,000 civilians trapped in western Mosul, unable or too frightened to leave despite the very real prospect of a prolonged, intense battle over the city between Iraqi government forces and IS fighters. The assault on western Mosul has, thus far, been largely as expected - a much better equipped and better trained Iraqi army than the one humiliated by IS in 2014, methodically pushing towards the edge of the city thanks to overwhelming fire power and the cover of coalition air strikes. For all their brutality and intolerance, IS fighters are nothing if not ingenious and in recent days they have been deploying a battle tactic almost unprecedented in modern urban warfare - the use of commercially available drones to drop bombs and grenades against civilian and military targets. Large military drones are, of course, used to devastating effect by armies all over the Middle East, often resulting in huge loss of life. 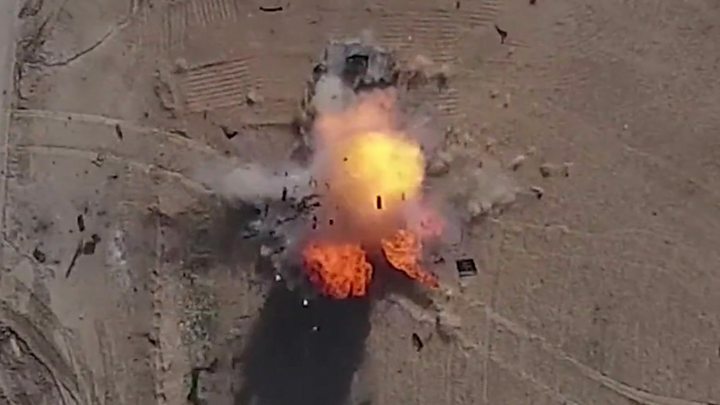 But the frequency and accuracy of how the Islamic State group is utilising small, relatively unsophisticated drones in Mosul has significantly slowed the advance of government forces. The drones have also caused panic among the civilian population, including residents of eastern Mosul. That part of the city was recaptured from IS last month during the first part of a campaign to drive the Islamists from their last stronghold in Iraq. At a hospital in the northern Iraqi city of Irbil I met 55-year-old Umm Mohammed. The mother of seven, from the eastern side of Mosul, was sitting up in her bed, attached to a drip and unable to rest because of the searing pain from her right leg. It had been shattered in several places by a grenade or small bomb dropped from a drone. "I'd just gone to the market for some shopping... The next thing I was lying on the ground and looking up. People started pointing up to the sky from where the bomb had come," she told me. "Where's the security when these machines are hovering over people and killing us?" The use of drones, with their relatively light payloads, will not change the course of this conflict. There are much more expensive, lethal and sophisticated weapons being deployed each day in their thousands. Yet the psychological impact of drone attacks cannot be discounted, says Emanuele Nannini from the Italian aid agency Emergency, which helps run the hospital where Umm Mohammed and several other drone victims are being treated. "Physically they are very similar to a mortar attack but actually they are very precise," Mr Nannini tells me, as he supervises a rapid expansion of the hospital beds and wards in anticipation of the battle unfolding in western Mosul. "So each of these drones is actually striking the target that was chosen. Psychologically it can be very bad for the population because they can strike at any moment and at any place." The residents of eastern Mosul are, ironically, getting a brief respite from the drone attacks because IS militants have diverted their attention to the new front line to the south and west of the city. A colleague who returned from reporting duties at the front over the weekend told me in graphic terms that it was "almost raining bombs" - such was the frequency and intensity of the drone attacks on forces trying to enter the city. Again, it's important to emphasise the overwhelming military and numerical advantage that Iraqi military units have over their IS enemies. They are also getting considerable help from their American and other coalition allies. "The fight in Mosul would be a huge challenge for any army, but this battle is only going to end with one result," says Lieutenant Colonel John Hawbaker, commander of the 1st Squadron, 73rd Cavalry. American "advisers" and troops are a common sight on and just behind the front line and at forward command bases, assisting and advising their Iraqi counterparts. But, as Lt Col Hawbaker readily acknowledges, American soldiers - so-called "boots on the ground" - are seeing action where it is deemed appropriate. Is so-called Islamic State finished? At the base I visited a few kilometres back from the western edge of Mosul, huge American artillery pieces fired shells at IS positions in and around the besieged city. The day before, the gunners told me, they'd had the busiest period yet in this conflict, lobbing hundreds of shells at distinctive targets picked out by their own spotters and much more sophisticated "eyes in the sky", or surveillance drones. The state of the art US weaponry will be of less use as the battle moves into the narrow, winding streets of Mosul itself. On the first day of real fighting inside the western zone, government troops reported encountering "dozens" of booby-trapped car bombs. Some of them were successfully defused but others exploded, killing and wounded several Iraqi soldiers. It's also thought that, in another example of drones adapted for urban warfare, IS militants are using the small aircraft to guide suicide car bombers to their targets. Amid the chaos and mayhem, Mosul's civilian residents are being exposed to unimaginable daily horrors. American and Iraqi generals say the fighting will be "house-to-house" in buildings where IS militants have deliberately placed themselves among the civilian population and in which they have constructed an elaborate network of tunnels to move themselves and their weapons. Outside the city, aid workers wait nervously. The UN refugee agency is building new camps, just to the south, preparing to receive as many as 250,000 internally displaced people. The real concern, as one UN aid official told me, is that most of the population won't able to escape, that they'll be trapped inside Mosul until the fighting finishes, the guns fall silent and Islamic State is defeated.